We're new, so there isn't much to say about us except words and phrases like integrity, honesty, gain knowledge, get it right, keeping pace with the times, all appear in our preamble. They appear there because they make up OmniLand's mantra. We intend to bring all these qualities to the front. Only time will vindicate us. What inspired us to start OmniLand Books? Been there, done that, so I know the road an author has to travel to get a publisher just to look at his work. The first self publishing companies flourished because the demand was so great. I needn't explain this to anyone trying to publish a manuscript, he knows, and if he is reading this he is probably shaking his head up-and-down. 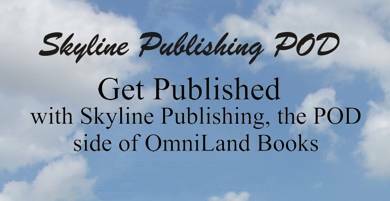 OmniLand will dedicate a good portion of it's time to the self publishing section of our agenda. I admit that some of my inspiration to organize a publishing company came from frustration I experience while trying to break down the barriers to publishing organizations and I wanted my own avenue to publication. No matter, if I can help others in my situation all the better, you are welcome to come along for the ride. There's the old saying, that uses ten two letter words, and it says it best: If it is to be, it is up to me. We're truly the new kid on the block, sending our first publication to the printer June, 26, 2006. We have come a long way in a short time. To check our progress, click Book Catalog. Copyright © 2006 OmniLand Books All rights reserved. This web site most recently updated on August 7, 2006.